8 years, 334 games, 17 trophies later, Javier Mascherano prepares to bid farewell to his beloved Camp Nou. A homage to Barcelona’s silent protector through the years. 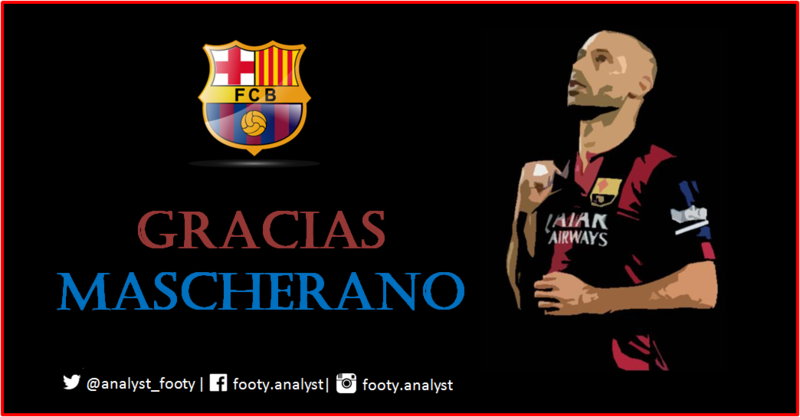 Gracias Mascherano! It’s 8th March 2011, Barcelona are up against Arsenal in Champions League Round of 16, trying to overturn a first leg defeat of 2-1 conceded at Emirates stadium. By the 71st minute Barcelona are 4-3 ahead on aggregate courtesy of two goals from Messi and one from Xavi. Arsenal have had ‘zero’ attempts on goal and their chance arrived in dying minutes of the game. Arsenal’s midfield prodigy Jack Wilshere intercepts a lose ball on right wing and releases Bendtner to a one-on-one situation with Victor Valdes. On the touchline, Pep Guardiola falls to his knees, he knows Bendtner is going to score. In that split second, the 95486 people inside Camp Nou hold their breath in disbelief. Suddenly, out of nowhere a diminutive figure emerges and the ball is latched away from Bendtner with a sensational tackle, Victor Valdes collects it with little effort. That player was Javier Mascherano, ‘El Jefecito’ as they call him. This one tackle saved Barcelona from elimination and they went on to lift the trophy at Wembley that summer. This was a career defining moment for Mascherano at Barcelona. In his formative years at the Buenos Aires based club River Plate where he played for two seasons from 2003 to 2005, he immediately established himself as a fan favorite in the Argentine folklore. River Plate fans bestowed him with nickname ‘El Jefecito’ meaning ‘The Little Chief’, drawing inspiration from his predecessor, legendary midfielder Leonardo Astrada. Mascherano’s reputation grew immensely at River Plate, prompting interest from Corinthians where he landed eventually. His time at Corinthians was plagued with injuries amid interest from European giants Barcelona, AC Milan, Real Madrid, Bayern Munich to name a few. Mascherano ended up at West Ham to everyone’s shock. A certain Carlos Tevez was also involved as the London based hammers completed a double swoop. His move was marred by ‘Third Party Ownership’ (TPO) scandal and he eventually moved to Anfield. In a team which already had two of the game’s biggest legends in Gerrard and Xabi Alonso, it seemed Mascherano’s chances would be limited but being a determined soul that he is, Mascherano immediately made his impact starting the Champions League final against Milan, just in his 11th game for the club. Liverpool unfortunately lost that night at Olympic Stadium in Athens but Liverpool had found their future star of the midfield. Mascherano would feature 141 times for Liverpool before departing to Barcelona in the summer of 2010. After the treble winning debut season, Guardiola wanted someone in the midfield who could play both as centre back and a holding midfielder. Vincent Kompany was considered as an option but Pep was adamant on Mascherano. During the 2009 summer, Barcelona made a late bid and Mascherano was in agreement for a move but the deal didn’t go through as Liverpool had just sold Xabi Alonso to Madrid. Being vocal about the move to Barcelona damaged Mascherano’s relationship with Liverpool fans. The following summer, Barcelona allowed Yaya Toure to move to Manchester and Rafa Benitez, who was one of Mascherano’s prime reasons to stay back one extra season at Anfield, also left for Inter Milan. Now more than ever, Mascherano wanted a move and Barcelona welcomed the dogged midfielder to Camp Nou. When Pep welcomed him at Barcelona, he asked Mascherano, “You know that you’re coming here to not play, right?” indicating the limited chances he will have at Camp Nou. To this Mascherano replied, “Be calm, with me you’ll have no problems.” This was the beginning point of his journey which saw him win two Champions League, four La Liga and Copa Del Rey titles each. Mascherano embodies passion, desire, determination and professionalism. Pep used Mascherano as a defensive midfielder and Busquets as centre-back in the second leg tie against Arsenal at Camp Nou in 2011. Such was the finesse of his performance that it prompted Pep Guardiola to convert him into a full time centre back. Without dithering, Mascherano accepted the new challenge, sacrificed his natural position and finished the season partnering Gerard Pique in the Champions League final at Wembley. The rest is History. A player who was brought in as a backup to Busquets, cemented his position as one of game’s most elite centre back. Mascherano belongs to the class of players whose importance can not be measured in goals or trophies. They are not the stars of your team and their contribution to the team’s success can not be determined in fancy stats of goals or assists. They just keep the their head down, away from all the spotlight and do their job without expectation of any accolades. With Mascherano you know you have a fighter who will defend the badge on his chest till his last breath. Watching Mascherano week in and week out, his last ditch tackles, his splitting passes, his command over the ball, is a sight that Barcelona fans will miss sorely. He was a shield, the last man standing at the heart of Barcelona’s defence. Mascherano’s reading of the game is impeccable. Among Barcelona’s legendary team under Pep, Mascherano and Xavi were blessed with the understanding, leadership and IQ to become a top coach one day. Dani Alves recalls who he tipped to become a top coach in future, “Mascherano. Whenever I talk to him, he tells me something new. It’s incredible how he reads the game. He notices things that others don’t.” Playing as a defender for Barca means handling a role of pseudo-midfielder while building the play from the back. Mascherano was a perfect example of how to read a game and distributing the ball, knowing when to push forward or keep the ball as Barcelona always kept a high backline. During his illustrious career at Barcelona, Mascherano has had only 1 goal to his name, a penalty he scored versus Osasuna last season in a 7-1 win at Camp Nou. After the game, Rakitic who was to take the penalty explained the story, “I wanted to take it, but Piqué told me to let Mascherano have it and he was right, you have to listen to the president.” That goal didn’t just add a number to his stats, it gave him the recognition he never craved. It was a reward in front of his own people for a brave warrior. A warrior who defended his turf with immense passion every time he stepped onto the battleground. After all these years of fighting, this was a token of gratitude from his home. The news of his departure is no surprise. During last year, Mascherano expressed his fear about his cycle at Barcelona coming to an end. He didn’t want to repeat the same mistake he made at Liverpool holding back for one extra season. Being a staunch professional that he is, he has stayed back at Barcelona for six months. Mascherano knows Barcelona’s next generation are ready to take the baton from him. It’s time for him to move on to the next phase of his life at Hebei China Fortune. #Barcelona have confirmed that they have reached an agreement with Hebei China Fortune for Javier Mascherano's transfer. He will join the club on 26 January. The number 14 is forever engraved in the memory of Barcelona fans as the ‘Cruyff Number’. Cruyff’s legacy is unmatched and won’t be paralleled by anyone ever. Looking back at his career, Mascherano has done more than enough to honor the legendary number ‘14’. He has carved a place of his own in the Blaugrana hearts, a player who always put the team before his personal self. He will forever be remembered by the Barcelona fans as the ‘humble servant’. “I arrived seven years ago to fulfill a dream and now it’s time to wake up. The dream’s over. It lasted longer than I thought. Now it’s time to say goodbye and I will carry with me a lot of affection”, El Jefecito signs off. Thank you for the memories!